Dela Black Bobobee is a Ghanaian writer. He was educated in Ghana and Nigeria. He holds a B.A English, and a Masters of International Law and Diplomacy (MILD), both from the University of Lagos. His hobbies are writing, studying local and foreign languages, and cinematography. He is a Life Member of the prolific Theatre 15 (University of Lagos), Abuja Literary Society (ALS), Actors Guild of Nigeria (AGN), and Peace and Collaborative Development Network. 1. This poem seems to have been written in anticipation of the 2012 elections in December. What impact do you hope that reading this poem will have on voters in the lead up to that event? Yes, you are very correct, this poem is indeed written in anticipation of Ghana’s next general elections in December 2012. Thanks to One Ghana, One Voice (OGOV) for the consideration to publish it. I also want to say here that the inspiration of this poem actually came from OGOV. I already know that OGOV online magazine enjoys a very wide readership, believe it or not. It is my strong belief that for those who would read this poem, its impact would be to make them reassess the enormous power they have in their hands to effect change in Ghana by voting wisely. It is the God-given right of the people to elect leaders of their choice, but they must do so wisely and choose leaders who have the genuine interests of the masses at heart. Perhaps we would learn something from “the still small voice” inside all of us, urging us silently to do the right thing at the right time, for the right reasons without being told to do so. 2. How optimistic are you that the 2012 elections will be successful and peaceful? What can Ghanaians - both the people and the government - do to increase the likelihood of that? My optimism is very high, I must tell you. Although, Ghana for some time now has proved to the entire world that democracy has come to stay for good, I believe there is still the need for more work to be done by both the people and the government to maintain and improve upon it. The people must be strongly cautioned against the trap of electoral violence, because ironically it is the ordinary people that would face the brunt of such hostilities rather than the political leaders who seek the vote and mandate of the people. They should be free to choose anybody suitable for the job of good leadership irrespective of tribal sentiments or for any greedy reasons whatsoever. There is a strong democratic wave sweeping across the entire globe. We all know what the Arab Spring means, but political changes must not all end in violence. On the part of the government, there must be a strong commitment to ensure free, fair and transparent polls. This can be done when the government adequately resources the Ghana Electoral Commission and put credible officials with proven integrity at the helm of affairs. When all these measures are fully implemented it would increase the likelihood of a successful and peaceful election come December 2012. I do believe that democracy can only flourish if there is an independent Electoral Commission, strong press, rule of law and other social institutions that operate with total transparency and commitment to the welfare of the masses. 3. Do you think this poem can only function in relation to Ghanaian politics in 2012, or can it have greater meaning beyond that? It is hoped that the impact of this poem would transcend Ghanaian politics in 2012, and continue to have a greater meaning anywhere in the world. I must confess that in spite of the much touted free and fair election feats in Ghana, past experiences have shown that in the aftermath, animosity, mistrust, and tribal sentiments are sometimes whipped by some unscrupulous politicians for their own selfish reasons, out of a strategic desire to cause disunity among the people. Ghanaians must rise above hate and greed, and live in peaceful coexistence, as entrenched by the tenets of Freedom and Justice which our founding fathers fought for with their lives. They are the past heroes whose labour must never be allowed to be in vain. We must rather maintain and improve upon it. We must practice our democracy in the unique circumstances of our environment, but I also commend a country like Canada as a model for the practice of democracy, and we must as well learn from their success stories as a roadmaps. Good governance is all about full participation in electoral process, transparency, accountability, predictability and social responsibility to our societies. 4. Like many of our readers, you went back through our archives to prepare for voting for your favourite OGOV poems of 2011, eventually voting for Martin Elorm Dogbo's "Forgotten Heroes" as your favourite. Were there other poems that stood out for you, or was Martin's poem clearly a cut above? Many poems mean a lot of different things to me in various perspectives at varying points in time. It all depends on the significance of the poem in question to the specific situation on ground and what is at stake. Yes, there are many other good poems that merit my vote but it was rather unfortunate that readers are not allowed to vote for more than one poem. What I will do is to go back and write intensive appreciation of most of the good poems from the archives that I have already missed. 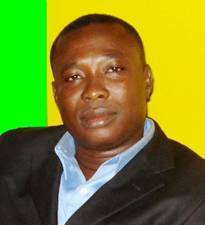 Initially, I chose "The Burial of Saint Domeabra" by Darko Antwi, but was told that poems published before 2011 are not eligible. Now, if you look critically at these two poems; you would see the subtle similarities between the thematic preoccupations of these two OGOV poets. In any case, I guess they both exhibit an elegiac undertone of real or mock postmortem experience of their subjects. It brings sad memories of the slain Muammar Gaddafi to my mind. History essentially repeats itself and would either prove posterity wrong or right. Only time alone can tell whether an individual is a true hero or villain. Like I said – “This poem's theme is very universal. The sad songs of “Forgotten Heroes” are sung in every language of the world, but it was handled with poetic artistry by Martin Dogbo with such melancholic undertones that pluck on emotional strings.” – just like the dirge poetry of Kofi Awoonor. The OGOV Editorial Staff Picks of "Mother of Ikemefuna" and "Mother of Equiano" by L.S. Mensah, was also a very good choice from a rather judicious point of view. LS Mensah is such an excellent poet with profound intellectual depths. Every “stardust” sprinkled on her for such good works is truly merited. Her works show such a remarkable insight into human nature. I was not surprised of the choice of staff pick, it only proved that I was not alone in my high opinion of her literary prowess. Other poems that I would have loved to vote for are "Accra" by Prince Mensah, and “18 Miles to Yeero” written by Nana Agyemang Ofosu. The poem “Accra “ is a very realistic piece. This is what I call a "slice of life." Nice work, Prince Mensah. Now, coming to “18 Miles to Yeero”… Hmmm…. I must say here that, Rob Taylor has already done a very excellent and an in-depth appreciation of that poem. That poem is very apt to the political situations we find ourselves in Africa today. It is a colour reflection typical of our political experience in this part of the world. It showcases how crafty politicians only remember the ordinary people during election periods but always renege on their promises to them after the elections are over. Another history is about to repeat itself come December 2012. Poetry can indeed be a very useful tool in the hands of the poet for the benefit of the masses, by sensitizing them to effect ideal political change in their various societies. Intelligence is not a privilege, it is a gift and it must be used for the benefit of mankind. 5. It's been a year and a half since you were last profiled on OGOV. What have you been doing in the interim? Any new undertakings in your life? New writing projects? I have been busy trying to balance my career demands with family issues. I have spent quality time with my family, getting to know my kids and monitor their formative stages with keen interest. I heartily welcome our own honourable OGOV Snr. Poet Darko Antwi, who has recently joined the Fatherhood League. Lol. In the interim, I have been very busy doing other things like academic researches, and moonlighting to jumpstart my own company which was incorporated in 2011. New writing projects? Yes, I have devoted myself mostly to screenplays, but I have also written a handful of poems, short-stories, and about to complete another full length manuscript. Congratulations to Rob and Mariska on the publishing your new books. Well-done guys. These are some of the cheering news I wish to be hearing about other OGOV contributors. I am also very happy to be back. I thank all the regular contributors here, and the OGOV editorial crew for holding the fort, and keeping this laudable dream alive. It could only get better. I wish you all a Happy New Year!